Flying a quadcopter (sometimes referred to as a drone) is incredibly fun and exciting. Flying also requires some skill, and when your multicopter is high up in the air and you suddenly lose control, you don’t want to lose your expensive model! 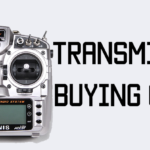 Many consumer multirotors now have GPS chips built into them. These GPS drones have assisted-flight features such as position hold, where you can let go of the sticks and the multirotor will straighten itself out and stay in one position, and return to home, in which you can flick a switch and the multirotor will automatically fly back and land where it took off from. At the end of the post, I’ve listed some tips and things to keep in mind – I highly recommend you read that, too. Note: While I’ve listed 10 different flight systems in this post, I wholly recommend you consider a DJI Phantom or DJI Mavic. 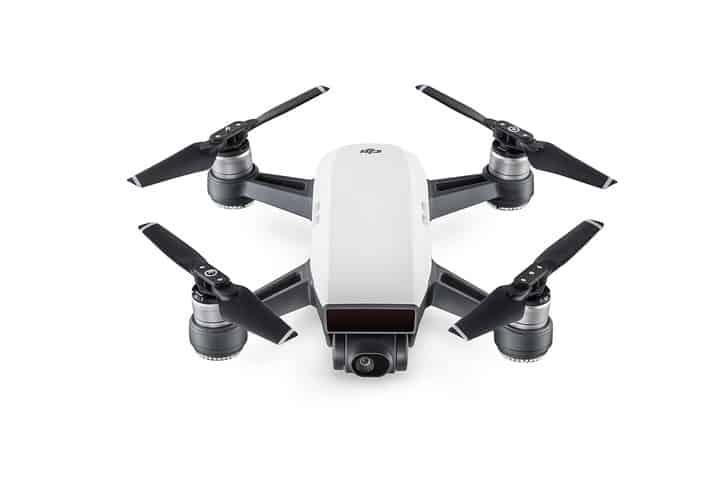 DJI has surpassed their competitors by leaps and bounds in terms of the technology and ease of use of their products, and they shine as an aerial imaging platform. The other brands will perform, but DJI is unmatched as far as an online community, repairs, and support are concerned. If you’re on the fence between a Mavic and a Phantom, read this post. 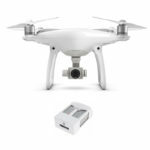 The DJI Phantom 4 is an all-around awesome aerial photography quadcopter. 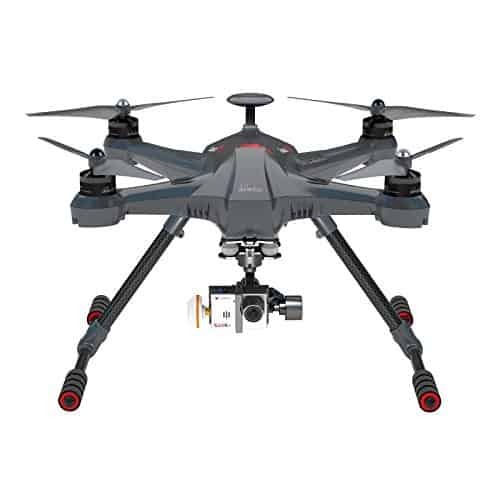 It has GPS and a built-in HD(4K in some models) camera that is stabilized with a 3 axis brushless gimbal, so no matter which way your quadcopter is tilted, the video will be smooth and straight. 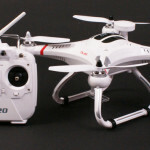 It has a very accurate GPS chip and sensors that let you fly it easily and smoothly. One really neat sensor is at the front of the quad, which prevents it from head on collisions with objects. The companion smartphone app lets you plan flights and gives you unprecedented control over how your craft flies. 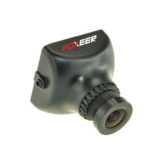 It streams video from the camera direct to your phone, so you can see what the camera is seeing, and you can simply tap on the screen to make the copter fly to that location. The phone also lets you select subjects to circle, follow, and track your photography subjects. The DJI Phantom 4 is meant to be an aerial photography platform which enables you capture high quality, smooth aerial videos. Safety features include visual sensors which “see” and assist in avoiding crashes and collisions. The Phantom also has a built in failsafe which will automatically bring the quadcopter back to where it took off from if you fly out of the radio’s range, or if the battery is running low. Note: This will only work if you’ve calibrated your Phantom properly before every flight. The smartphone app also records comprehensive flight logs of every flight you take, including sensor data and a flight path. 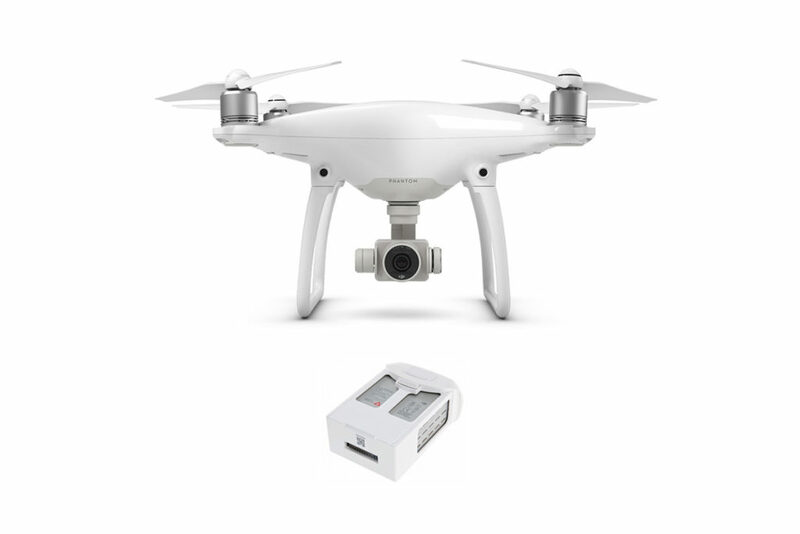 The average flight time of the DJI Phantom 4 is 25-28 minutes per battery. For most consumer/semi professional purposes, you can’t go wrong with a DJI Phantom. It’s relatively portable, flies like a dream, captures stunning, stabilized 4k video, and is so easy to fly you can literally start flying it right away. Consider all of the features of the DJI Phantom 4, and condense those into a tiny quadcopter that can almost fit into your pocket. 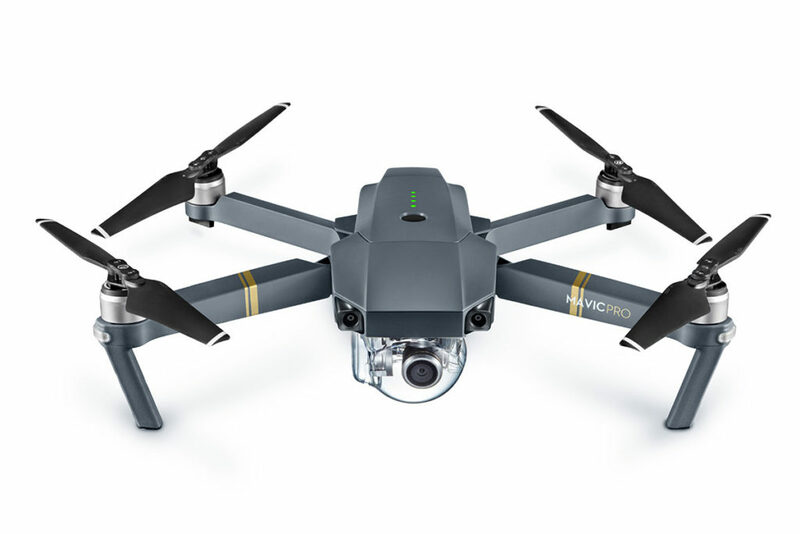 The DJI Mavic Pro is a phenomenal folding quadcopter that is small enough to fit in your pocket when folded up, and big enough to give stable, smooth flight when opened up. The Mavic is my new favorite camera drone of all time. It has a stabilized(3-axis gimbal) 4K camera with a field of view just a little smaller than that of the DJI Phantom 4. Range is awesome, and while DJI advertises 7km, I don’t advise you to fly that far out! Still, even 1-2 or even 3 km of range is fantastic, considering you’d still have clear video and full control of the copter. The Mavic can be controlled with the DJI radio hooked up to your phone or just by your phone itself. If you are just using your phone, your range will be cut to around 50 meters, which is about as far as a decent wifi signal goes. It has many sensors on board including GPS and visual sensors which help the copter maintain its position, fly smoothly, and avoid obstacles. In fact, it can maintain a set distance from the ground even if the ground even if the terrain changes. I highly recommend getting the combo with the radio as that will allow you to fly much higher and further away, and will give you greater control over your copter. Speaking about the Mavic, you know what new drone which is even tinier than the Mavic? The Spark, is half the size (and half the price) of the Mavic … but with practically the same features as the Mavic! It’s the drone which DJI are hoping to spark an even larger proliferation of drones, by bringing the price of a smart drone to the the price of practically a smartphone. In fact, drone review site, DronesBuy.net has listed the Spark as being one of the best drones for iPhone users. The intent is that drones with cameras and smart features become a common gadget, rather than something which is exclusive to photographers, video professionals or other niches users. 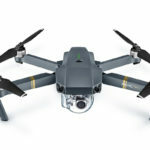 The Spark most of the smart features of the Mavic and has plenty of fun features such as gesture control, the ability to take-off and land in your hand, Flight Autonomy, Return to Home, Intelligent Battery and plenty of other great features. For such a small drone, (it weighs only 300g), it has a very good flight time of 15 minutes. The Spark also has great camera specs, with a 12MP sensor for great photos and Full HD but 4K is not supported, which is typically not a big deal. The remote transmission is up to 1.2Km and as with most DJI products comes with the basic package and the Fly More bundle. The Walkera Scout X4 is a ready to fly aerial photography solution that comes with everything you need to get in the air, shooting video, and flying FPV. The Scout X4 comes with a Walkera Devo F12E which has an FPV receiver and screen built in to it. Also included with the Scout is the Walkera iLook+ camera, which can both capture HD video and transmit it via 5.8 gHz to the receiver built into the radio. You also get a 3 axis gimbal that will stabilize the camera and let you capture awesome aerial footage. The landing gear retracts so that they don’t get in the way of camera footage. The Scout X4 has all the features you’d expect from a GPS quadcopter – return to home, failsafe, follow-me, position hold, and route planning. The huge 5400 mAh battery lets you fly for 20-25 minutes. It’s a little bit on the expensive side, but considering all the stuff you are getting in this package deal, it may be worth it. 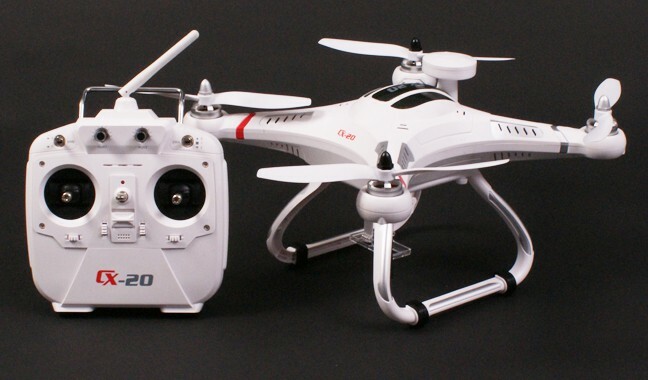 The Cheerson CX-20 is the least expensive GPS quadcopter you can find on the market today. 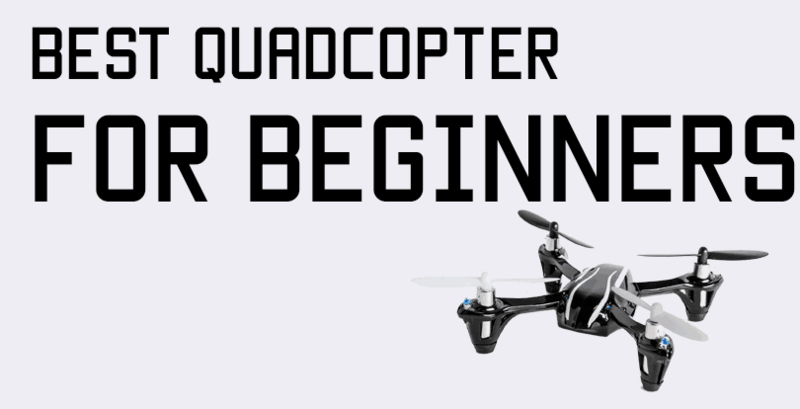 It’s built solidly, uses open-source software(which means you can do mission planning and autopilot), and has most of the necessary GPS features of much more expensive quadcopters like the Phantom and Iris+. The CX-20 is a ready-to-fly kit, which means you get everything you need to fly right out of the box. The radio is built well and feels good in your hands. GPS features include position hold and return to home. Return to home will also kick in once the battery is too low. There’s no gimbal or camera included with the CX-20, but at $250 for a working GPS-enabled quadcopter with a radio and battery, you just can’t beat the value. The Cheerson CX-20 is quite speedy, too, with a top speed of 10 m/s. If you want to get into GPS drones but don’t have the budget at this very moment for a more expensive model, the CX-20 is a great starting point. As your budget allows, you can add a gimbal and camera later on. 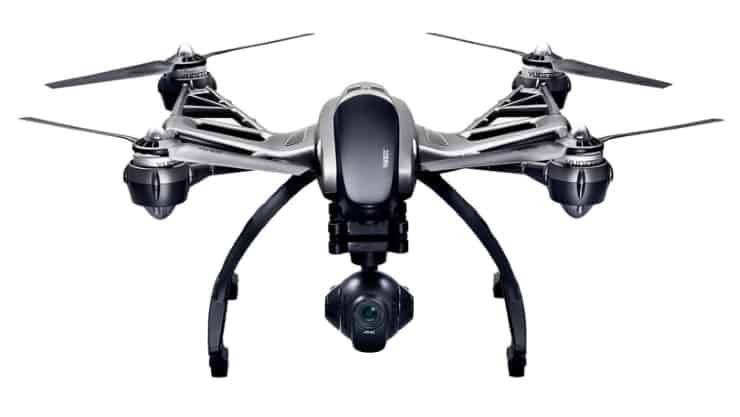 The Yuneec Typhoon Q500 is a powerful aerial photography solution that takes the popular DJI Phantom head-on. It has a built-in 4k camera and gimbal, and captures stunning photos and videos. 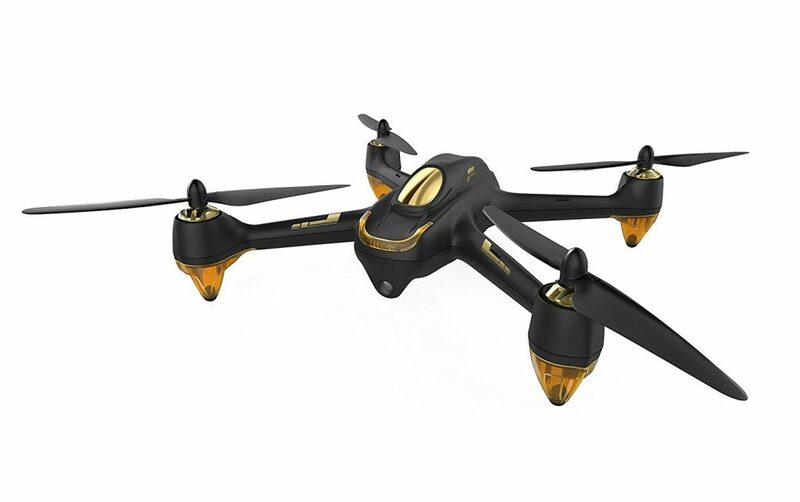 The GPS features are standard as with all advanced GPS quadcopters – follow me, position hold, return to home, and “watch me”, in which the quadcopter will keep always keep a particular object in frame. For safe flying, the US version of the Typhoon Q500 takes FAA regulations into account. It won’t fly in no-fly zones(within 5 miles of an airport), and prevents the quadcopter from flying more than 300 feet away from the pilot and more than 400 feet above the pilot. This mode can be turned off, though, but if you are a novice pilot, it’s not recommended to do so. The Typhoon Q500 is also a ready to fly kit which includes everything you need to get airborne. The radio that comes with the Typhoon has a built in screen so you can compose your shots properly. I have always thought of Hubsan copters as toys, but they seem to have upped their game over the past year and now are entering the GPS drone market. 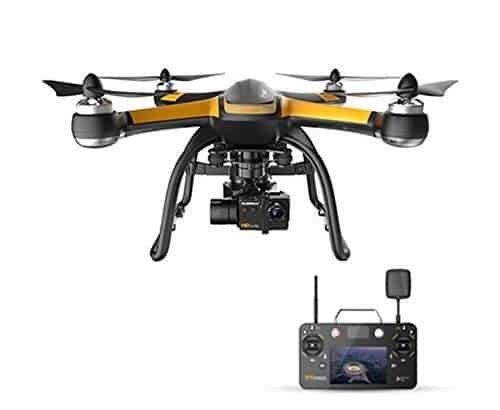 The Hubsan H501S is a low-cost solution to getting into GPS drones, and it is equipped with a 1080p camera and basic GPS functionality. The onboard camera is 1080p, but it is not stabilized, so the video feed will tilt up and down with the movements of the copter. With it, you’ll get a remote control with a built in video screen(video range is about 300m) and a charger. Do not use anything else to charge the drone, only the supplied charger! 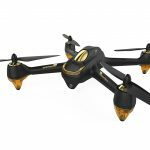 Considering that this drone is less than half the price of many of the others on this list, it’s not a bad starting point. 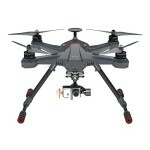 The Hubsan H109S is a direct competition attempt from Hubsan with the big dogs like DJI. The basic functions of the H109S are quite similar to those of DJI copters. You have a stabilized 3 axis gimbal with an included 1080p camera. The video is quite smooth and you can control all three axes of the gimbal from your radio, which is a nice touch. The drone is controlled from the included radio – which has a 5.8 gHz video receiver built into it, and it can give you about 300-500m of range. They advertise 1000 meters, but I don’t think you’d get that much range unless you’re flying in a wide open field with no obstacles around. The radio has an Android tablet built-in from which you can access a map and tap on places on the map for the drone to automatically fly to – that was a pretty nice touch, if you ask me! The drone itself flies pretty well, and can be quite aggressive in flight, too, if those are the kinds of shots you want to take. This drone is a little bit cheaper than the DJI Mavic and Phantom, so if you’re looking to save a couple of hundred dollars, or you’re just not that into DJI, then consider picking one up! The quadcopters I’ve listed above are all ready-to-fly solutions. 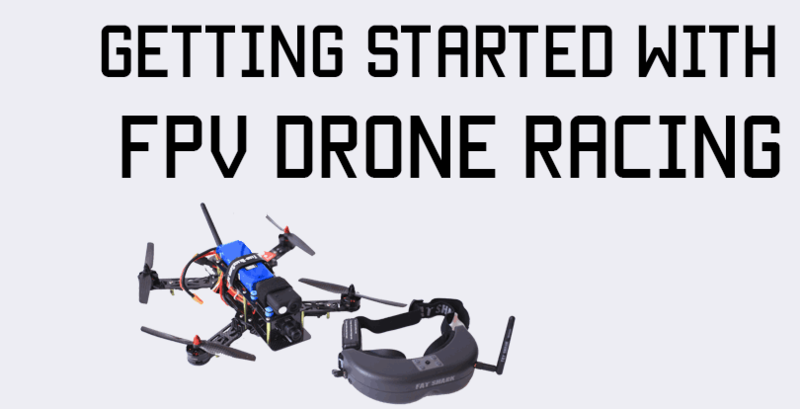 If you are more of a DIY guy, then you can build your own quadcopter using a flight controller that supports GPS. The DJI Naza comes in two versions – the Naza M Lite an the Naza V2. The basic features in both flight controllers are the same. They both are incredibly stable, with and without GPS, and have GPS features like position hold, return to home, and a mode where the quadcopter will respond relative to your position instead of the quadcopter’s actual position. The Naza V2 is more advanced than the Naza M Lite in that it has support for autonomous flight, and is slightly more stable. If you are building an aerial photography drone from scratch, these two are great plug-and-play flight controllers that require very little tweaking and configuration. 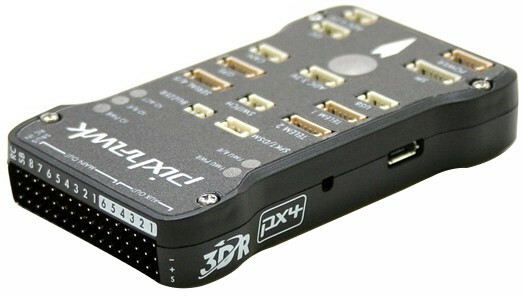 The 3DR Pixhawk is the flight controller at the heart of the Iris+. It is also available to use in DIY builds, and when coupled with an external GPS adapter can let your multirotor become fully autonomous. The GPS chips and advanced flight controllers that drones now have are incredibly complex and do thousands of calculations per second to keep you in the air. However, you should know that GPS is not foolproof. You must practice and become proficient at flying without GPS, and not rely solely on GPS as your safety net. Think of GPS more like a backup plan. If you are using GPS return to home every time you want to land – relying on it alone and not refining your piloting skills, you are doing it wrong and are endangering yourself and other people and property. These things are machines, and like all machines, things can go wrong. In quadcopters such as the DJI Phantom and other GPS enabled machines, the GPS chip alone does not hold the quadcopter’s position. GPS can only see where the quadcopter is in terms of two coordinates – latitude and longitude. When you start up your quadcopter, there will usually be a series of lights(remember to read the instruction manual!) that indicate whether or not the GPS has a lock. Remember to take off only after the lights confirm that the GPS signal has a lock, otherwise your quadcopter won’t fly properly, or worse, it’ll fly away. The GPS chip doesn’t let the quad know which way the quad is, which direction it is facing, or how high it is. Each of those data points has a dedicated sensor. The flight controller, or brains of the multirotor, relies on accelerometers to help it judge which way the quad is. Is it upside down? Is it tilted to the right? To the left? Is it straight? Accelerometers are the same devices that your smartphone uses to know which way you have tilted your phone. They’re also used in video game controllers like the old Nintendo Wii which used it to judge which way the remote was facing and how fast it moved. Accelerometers are usually calibrated when you start your quadcopter up. When you power it up, keep it on a flat surface for a few seconds to let the sensors initialize properly. If your multirotor seems to drift around a lot more than usual, your accelerometers are out of whack, and you should refer to the instruction booklet for how to calibrate them. As for which direction the multirotor is facing, that is detected by an onboard magnetometer, which is a digital compass. Calibrating the magnetometer is very important, because if not done correctly, your quadcopter won’t know which direction to fly in if you do an emergency return to home! To calibrate the magnetometer, you usually turn the quadcopter around on all of its axes, which means you flip it forward 360 degrees, flip it sideways 360 degrees, and rotate it 360 degrees. The quadcopter’s altitude is gauged by a digital barometer, which usually doesn’t need to be calibrated. All of these sensors are usually calibrated together in your start up sequence. Just remember to follow the instructions to the letter and calibrate every time you fly! I definitely like the Yuneec – but have you tested the Autel Robotics line? DJI Mavic is incredible, features are great too. The Yuneec Typhon Q500 is undeniably has a good physical design and its features as well. DJI mavic is great! The specs are also on point. 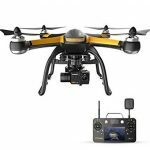 Hi Gulzaar, I thoroughly enjoyed your Best 10 GPS Drones list. I learned a few useful information other than the recommended models. Based on my experience, I would dub DJI Spark as one of the best drones with GPS. It is compact, fit into my palm, and comes with tracking modes. 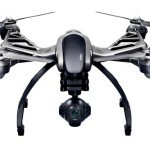 Yuneec Typhoon Q500 is also a good option, but the expensive price tag is a bit of let down. Hubsan H501S seems an ideal choice for budget-conscious people especially with 20 minutes of flight. Also, have you tested the DJI Mavic Air yet? If yes, how does it fare against your recommended models for GPS function? Hi Oliver, I have not been able to test the Mavic Air yet. Thanks for stopping by! 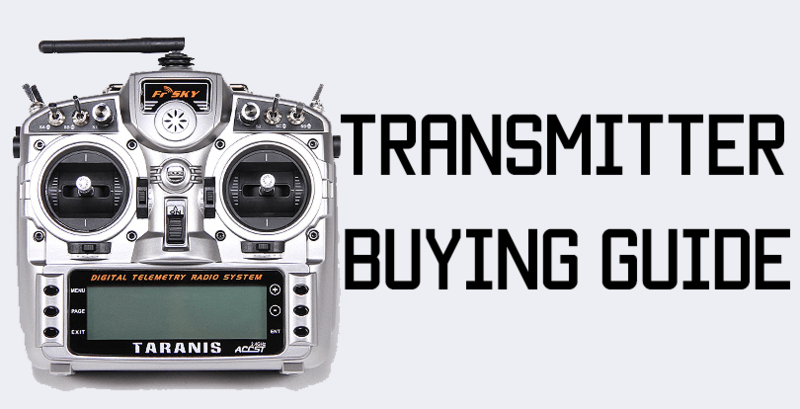 What is the difference between Drones with GPS and a GPS tracking device? I’m sorry to ask this question i am only a beginner.